Steve Tandy believes Ospreys' pair Rhys Webb and Dan Biggar have made a strong case to be selected for Wales in the autumn internationals. Ospreys are top of the Pro 12 with a 100% record after six matches with Webb and Biggar key in their success. "I think they're really putting their hands up their performances over the last six games has been outstanding," said Tandy. Wales play four games next month, starting with Australia on 8 November. Fly-half Biggar, 24, was first choice on Wales' summer tour of South Africa, when he was partnered by Racing Metro's Mike Phillips. And 25-year-old scrum-half Webb last played for Wales in the Six Nations defeat by England in March. But he was named man-of-the-match in Osprey' comfortable 26-15 win over Cardiff Blues. With Phillips not starting for Racing and Scarlets scrum-half Gareth Davies injured, Webb is making a strong bid for inclusion in Wales coach Warren Gatland's squad. Tandy has been impressed with the influence of his half-backs during his team's impressive start to the season. "The way they come to work is a real pleasure," he said. "Every time they come to work they're always desperate not only to better themselves but also they're demanding standards of the group. "They've worked really well together and I think at the moment they're on top of the game. "They're running the game, putting us into positions where it's difficult for people to get at us." 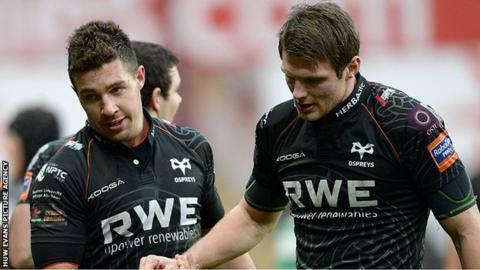 Ospreys' unbeaten start includes a 19-14 win over Munster in Limerick and a 63-13 hammering of Edinburgh. It's a great start for us, but a start is all it is," added Tandy. "It's great to end this block with six victories which is something really pleasing. "There was a lot spoken and writing us off, and now suddenly we're a fantastic team - I think something in the middle is about fair. "And I think we are getting better our young boys are improving week out and it's nice six games in that we're still unbeaten."